Hello, my name is Susana and I have severe addiction to over the thigh boots! 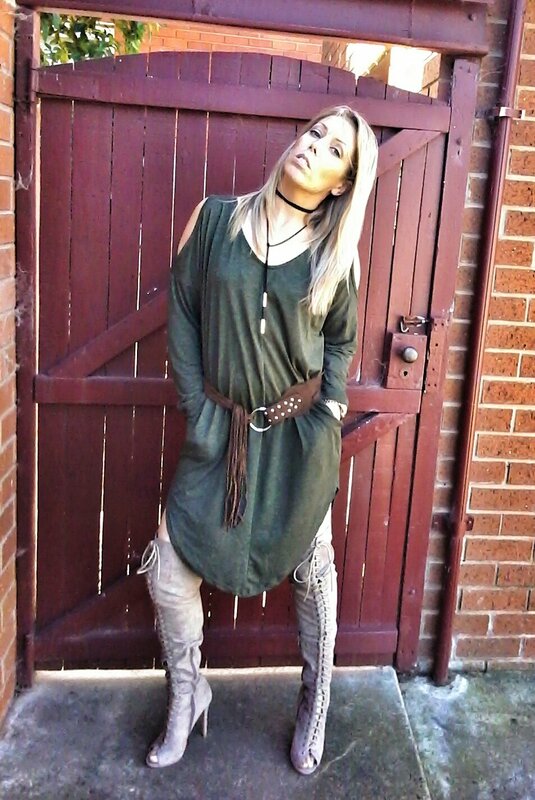 If everyone saw one of my spare bedroom’s at my house, you would see a long line up of many many over the thigh boots – in all different styles, materials and designs. This one I bought from Pretty Little Thing just before the end of last year and today I finally wore it. If you haven’t already noticed or been living somewhere in the Antarctica, shoulders have been an important fashion focal point for the past couple of years and the trend is not going anywhere just yet. Off the shoulder tops and dresses are popular for both day and evening, but what’s now gaining in popularity are cold shoulder tops and dresses. OK, so originally this asymmetric cold shoulder top is meant to be worn with either jeans or leggings but because of the length of it. However I decided it would be great to turn it into a dress, basically a t-shirt dress. The back of it is longer and the front just slightly sits above your knees and it has two slight splits, one on each side. 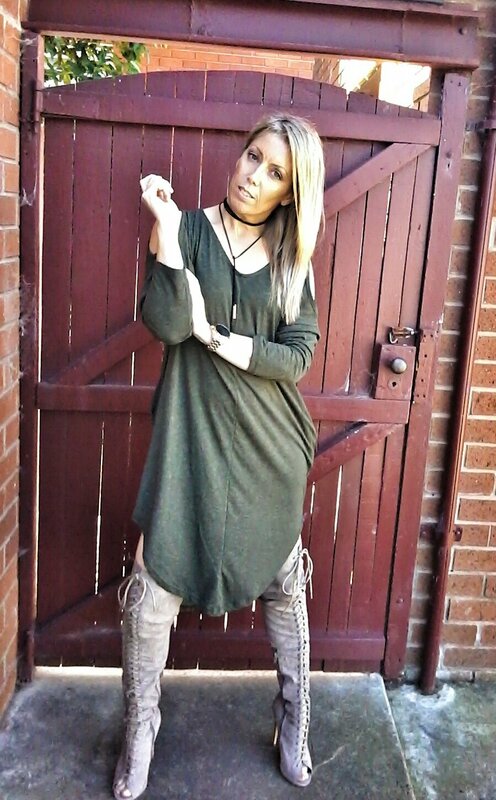 It’s a perfect top/dress to wear in the spring and summer weather, and you can even wear it in winter by adding a bomber jacket to give it that street look vibe. 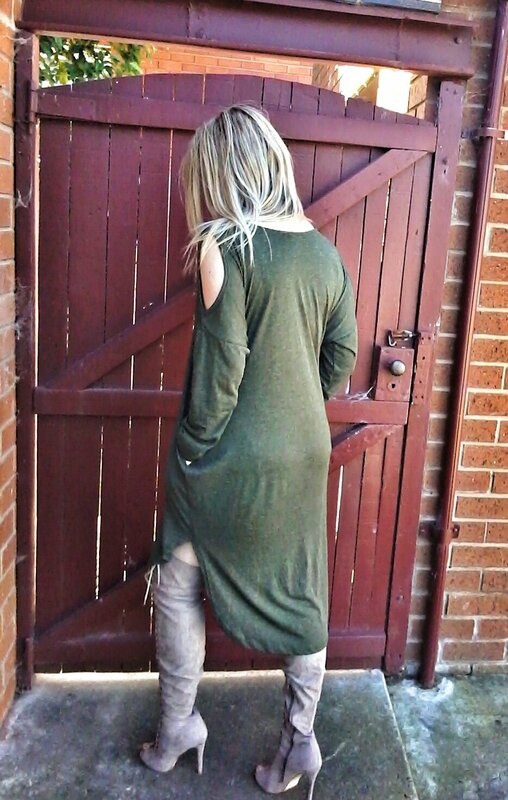 I also bought this top (dress) in rustic as well, as I’m very much into terra colours (.ie. 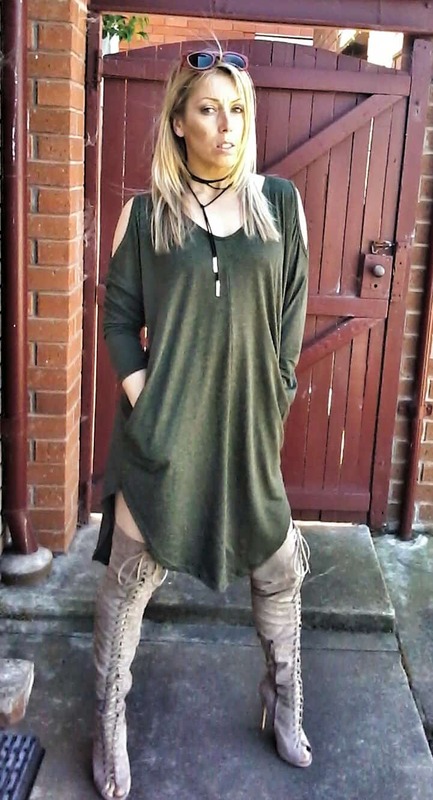 browns, olive, rustic). 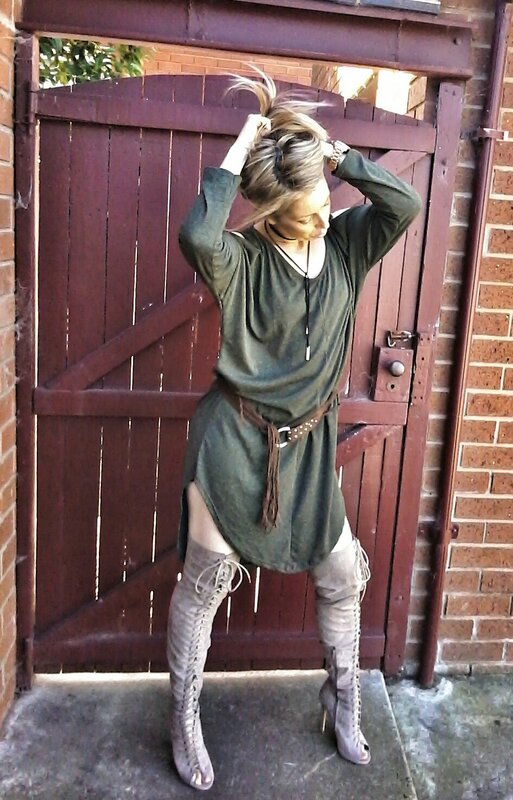 By changing up this top (dress), I added this 80’s style belt which came with some boho pants I bought on my holidays in Portugal. An incredible belt can make any type of everyday dress look seriously fabulous! It completely switches up the look dramatically and also changes your silhouette. Regardless of the belt, if you’re looking for an easy way to elevate your everyday wardrobe, this styling trick is it. Katrina Asymmetric Cold Shoulder bought at BooHoo), and Malinda Mocha Lace Up Peep Toe High Boots (currently on-sale) bought at Pretty Little Thing .